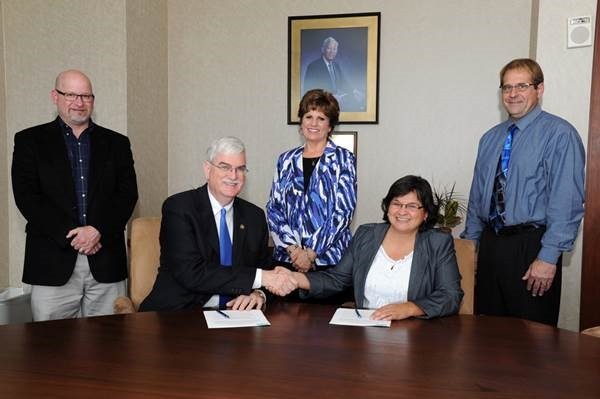 CORPUS CHRISTI, Texas – Texas A&M University-Corpus Christi and the Coastal Bend College (CBC) signed a Memorandum of Understanding establishing a joint admissions, transfer, and enrollment program between the two schools during a ceremony on Wednesday, Nov. 6, on the Texas A&M-Corpus Christi campus. The program will provide a more seamless transition for students by allowing them to transfer from one institution to the other, alternate enrollment between institutions, or enroll concurrently at both schools. Students entering the program must choose and declare enrollment as a degree-seeking student at either CBC or Texas A&M-Corpus Christi and follow the core curriculum requirements of that institution. A reverse transfer program allows students who transferred to Texas A&M-Corpus Christi prior to the completion of an associate degree to transfer A&M-Corpus Christi course work to CBC towards an associate degree.